A reading of the Symphony that has prompted me to reevaluate my relationship with the work. (...) Not even Kempe characterized this music so vividly and Storgårds knocks the perfunctory Franz Welser-Möst right out of the ballpark. (...) Ondine's engineering is excellent (...). Strongly recommended! 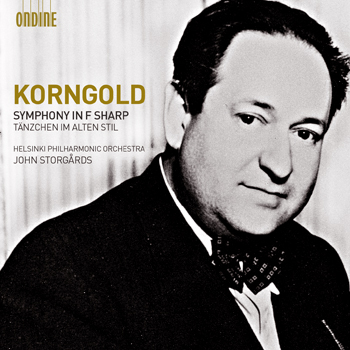 John Storgards typically pays great attention to details of string articulation and to Korngold's always glittering textures. Une nouvelle réussite à créditer à un chef toujours étonnant. Helsingin kaupunginorkesteri ja John Storgårds (...) uljaalla tulkinnalla, jossa uhkaavasävyinen avausosa puhkeaa lopussa kinemaattisen virtuoosiseksi finaaliksi. HKO:n vasket loistavat kultivoituneella paatoksella ja hitaasta osasta kaivetaan esiin tummat pohjavärit. Das Philharmonische Orchester Helsinki zaubert unter der Leitung von John Stohrgards diese Breitwandsinfonie ausdrucksstark und nuancenreich auf unsere innere Leinwand. Dieses nordische Traditionsorchesters hat hier wirkliche Pionierarbeit geleistet (...). (...) Helsingin kaupunginorkesterilla, joka on Suomen paras yhtye muhevaan myöhäisromantiikkaan. (...) Korngoldin musiikki vaatii orkesterilta sekä Hollywood-makeutta, tukevaa myöhäisromantiikkaa että Prokofjev-tyylistä iskukykyä. John Storgårds ja Helsingin kaupunginorkesteri pystyvät vastaamaan kaikkiin näihin haasteisiin, ja etenkin Suomen parhaat vasket pauhaavat uskottavasti. This Erich W. Korngold disc couples the monumental Symphony in F sharp with the world première recording of a rare discovery piece, Tänzchen im alten Stil. The 50-minute Symphony in F sharp major is Korngold's only symphony, written in a late Romantic style. Composed between 1947-1952, it is dedicated to the memory of Franklin D. Roosevelt (who died in 1945). Dimitri Mitropoulos wrote in 1959 about this masterpiece: "All my life I have searched for the perfect modern work. In this symphony I have found it." Tänzchen im alten Stil is an 8-minute piece which 19-year-old Korngold wrote in 1917, while doing his military service in World War I. The work fell into oblivion and was given its (supposedly) world premiere no earlier than 2007, at the Jyväskylä Festival, Finland; the performance was led by John Storgårds, who on this CD conducts the Helsinki Philharmonic Orchestra.